Another year, another award ceremony, another night out. 500 odd for 18 was the final damage inflicted by the Indian opposition though Stuart wasn’t impressed with the extras conceded. It was such a mammoth session some of us missed the last train home and had to rely on a Panther. What did we learn from the season, Phoenix now has a strong selection of players making more runs and taking more wickets than previously with the belief of winning tight matches. The club is now thriving with more quality players queuing at the pavilion, I can now smile and gracefully retire with the knowledge that we now have a village team that has done more than just rise from the ashes. Six to tie off the last ball is always a big ask and so it proved as Phoenix fell just short in the gloom. Yep, this would have been another good toss to win. This was the game that was rained off at the start of the season if you remember. Rain that is. Apparently it’s wet stuff that falls out of the sky. St Barnabas elected to make us field in the heat (sound familiar?) and three of their bats managed to get to the retirement threshold or very near after Adrian dismissed George’s frenemy Gavin. Alex had their remaining danger man caught behind after Jeff had removed a middle order man for a duck and George completed a run out too. Just the four wickets for us then but only 116 runs for them despite all the batting to come: our ever-erratic pitch was once again refusing to help batsmen. Dave and Jeff once again led the charge and the former was joined by Ralph, who hit a six on his way to another unbeaten knock. Peter and Nick contributed a few each to keep the score ticking over as Damon, skipper in Gareth’s absence, came in at six to guide us home. Bruce provided the support act, guiding the shot of the day to the boundary. We needed eight off the last over to win it and had Damon on strike but, with the sun long having disappeared behind the pavilion, he couldn’t get any of the first three balls away and when he hit the next for a brace it meant he had to retire. George came in for mission improbable but suffered the same fate and our third match of the season to be decided on the final ball went the way of the opposition. When the Great Floods of 2022 wipe out our entire fixture list, and Stapleford itself, surviving Phoenix men will look back on the summer of 2018 and remark: boy was it hot at Barrington. And it was. Needless to say Gareth came second in the coin toss stakes once again and we were soon baking steadily while their openers feasted on roast bowler. Both were top-class and Alex and Simon did well to make them work hard for their retired not out knocks, which saw the TTP score bounce along at eight an over, sometimes higher. Their absence made a difference however and we started taking wickets and bringing the rate downwards. 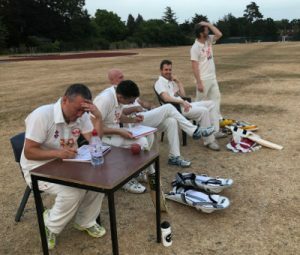 The Fixtures Secretary began it by tempting their number three into snicking a wide one and George and Tim took advantage of the open door that was their mid-innings to remove batsmen without too much damage – George claimed two and Tim three, both bowled excellently. Jeff was unleashed late on and dismissed two more in an equally fine spell; the loss of Matt to a twisted ankle on the boundary did not turn out to be a significant blow. TTP posted 137-8 in the end. Dave and Jeff put willow to leather in reply before the former was run out by a superb direct hit. Jeff went on to post another not out score but Ralph was quickly removed and our middle order, up against some accurate bowling, couldn’t prevent the required run-rate from reaching double figures despite some lusty hitting from Simon and George, who clubbed a six into the shrubbery.